According to reports, up to fifty new Nazca lines have been discovered by experts, and some of them are among the oldest lines ever found, predating the Nazca culture by around one hundred years. A group of researchers has made a stunning discovery in the Nazca desert in Peru. With the help of satellite images and drones, archeologists have managed to uncover 50 new Nazca Lines and numerous other mysterious geoglyphs carved into the earth by a mysterious people, thousands of years ago. Some of the newly found Nazca lines are reminiscent of Pyramids. Thousands of years ago, for a reason scientists still can’t comprehend, a mysterious civilization drew massive geoglyphs and figures into the Nazca desert in Peru. Thousands of these strange geoglyphs cover the sandy soil of the Nazca province which in addition to the strange sandy is home to various elongated skulls. The Nazca lines vary in complexity: So far, experts have distinguished hundreds of simple lines and geometric shapes; more than 70 zoomorphic designs of animals, such as birds, fish, llamas, jaguars, and monkeys, or human figures, and other designs including phytomorphic shapes, such as trees and flowers. And when experts thought they had cataloged and found all the Nazca lines there is, a eureka moment struck them after a survey performed with drones and satellites revealed 50 new Nazca lines in the arid desert landscape. While most of the Nazca lines were carved by the Nazca people, researchers say that the newly found lines were carved by the cultures predating the Nazca; the Paracas and Topará cultures between 500 B.C. and 200 A.D. Experts explain that unlike the famous Nazca lines—most of which are best seen from the air—the Paracas glyphs were laid down on hillsides, making them visible to villages below, reports National Geographic. Scientists explain that centuries before the Nazca people created the world-famous Nazca lines, people in the region were experimenting with making massive geoglyphs. “This means that it is a tradition of over a thousand years that precedes the famous geoglyphs of the Nasca culture, which opens the door to new hypotheses about its function and meaning,” archaeologist Johny Isla of the Peruvian Ministry of Culture, who is in charge of restoring and protecting the lines, told National Geographic. Most of these new figures are warriors. 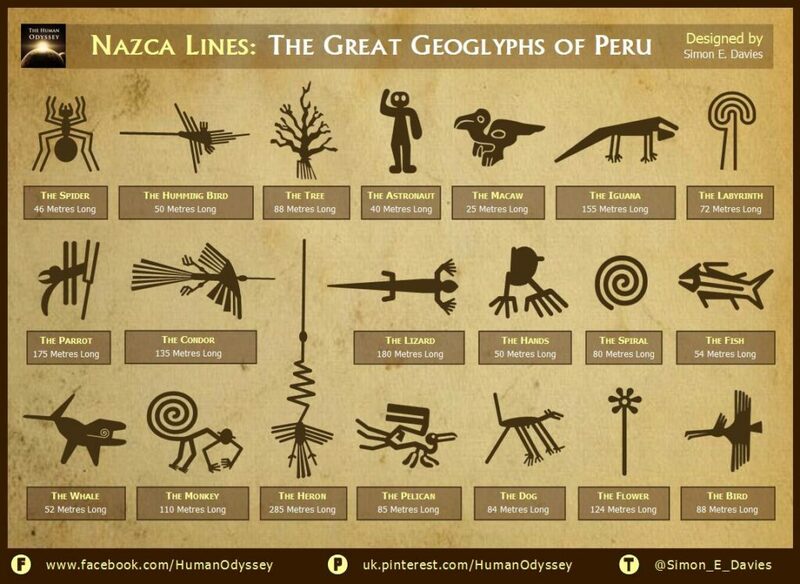 The new glyphs are not even registered as part of UNESCO’s world heritage, but fortunately, they are not in danger. In fact, their discovery will keep them away from urban projects or roads.